"The best in me are memories. Many people will come to life in them, people who gave their blood while they lived, and who will now give their example." How do you write about the past - about emotions and memories? How do you know if you are being objective? How do you know if your memories are even real, much less accurate? 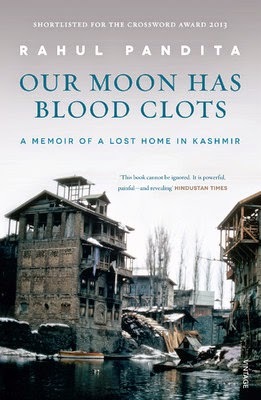 Rahul Pandita's Our Moon Has Blood Clots is about the exodus of the Kashmiri Pandits from the Kashmir Valley in 1990. The book is necessarily full of his memories - memories that are more than two decades old, and which have probably been stained, for good or bad, by nostalgia and longing. As a journalist used to sticking to facts and data (though he has written some great opinion pieces as well), it must have been difficult for Pandita to write a book filled with so much pain. He deals with the problem by sticking to the facts - as he remembers them. His language is cold, clinical, unemotional. In fact, the first three parts of the five-part book read like a bald robotic description of what happened. Pandita seems to have attempted something very similar. He talks about how the Valley was when he was growing up (he had many Muslim friends, despite the fact that the Pandits and the Muslims supported opposing sides during Indo-Pak cricket matches). How the atmosphere slowly changed in the eighties, how the killings started, and how the Pandits started worrying for their lives. And then, the exodus - the terrible choice between leaving their home, and losing their lives. And how life is as stateless refugees who have lost everything they had. The tragedy is that this isn't even the first time that they had to move. Part 4 of the book, narrated by his maternal uncle, describes the earlier exodus. The family had earlier lived in Baramulla - their home was destroyed during the Pakistan-supported Pathan invasion of 1947, and they had to shift to Srinagar. And barely a few decades after they had picked up their lives, they lost everything again. It's in the final part of the book that the dam bursts. All the emotions that Pandita has held in check in so far erupt in a flood - the pain of homelessness, the longing for home, the helplessness he feels in being unable to take his parents back home. It's this part of the book that puts everything else in perspective. Though the book's sub-title says it's a memoir, I do wish that he had let his journalistic side out a bit more - he could have done some analysis on what caused the sudden outburst of militant activity in the eighties. Maybe it's tough to bring that level of objectivity to something that's so close to your heart, but it would have added a deeper layer to the book. Pandita ends on a positive note. "I will come again," he says, "I promise there will come a time when I will return permanently." This seems quite optimistic, given the current situation - but we can only hope.